Nigel Stroud and Mazdaspeed got back to work on their new 767 and new 13J rotary engine. The 13J features four separate combustion chambers compared to the 13G with three. The swept displacement of the four rotor powerplant was 2.6L, and using the four stroke equivalency formula, the engine was comparable to a 5.2L conventional internal combustion engine. The four rotors chucked out 600 horsepower at an eardrum shattering 9000rpm. Adding a fourth rotor however lengthened the engine, forcing Stroud to modify his chassis design. Largely conventional, the chassis was another aluminum monocoque reinforced by a composite honeycomb core. The suspension followed a similar design method to the 757, as did the body. Overall, the car was too light on its own to make minimum weight for the IMSA spec GTP class, and so ballast was needed to tip the scale at 800kg. 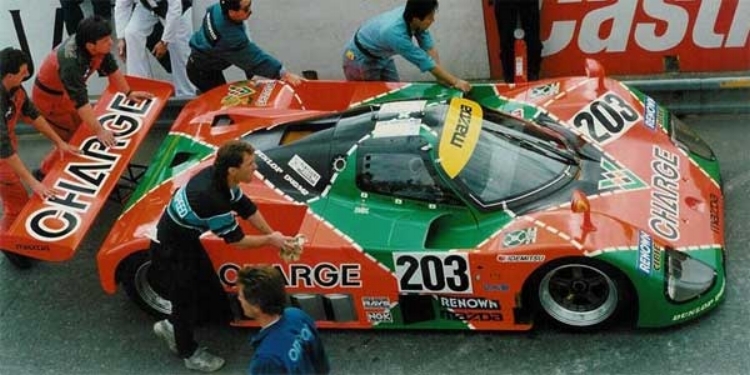 Mazdaspeed also picked up major sponsor Charge, a Japanese clothing/textile company that brought with it one of the most famous racing liveries of all time, the green and orange argyle. The 767s were brought out for the start of the World Sportscar Championship and saw mixed results. Le Mans was not a particularly noteworthy event for the team as the two cars finished 17th and 19th, both behind the 15th place finishing 757. The remainder of the season was campaigned solely in Japan in the JSPC. With a decision made in December by Mazdaspeed to continue competing on a world stage, they had to form a base in Europe to remain close to the competition. It was an easy decision as Australian Alan Docking was given the nod to assembly the Japanese team’s presence not far from Silverstone circuit. Docking was an obvious choice having helped Mazdaspeed at both Silverstone and Le Mans in 1983 and housing the BFG Lola-Mazda team in 1984. Docking appointed aeronautical engineer Steve Farrel to manage the team, and with Stroud confident he could make improvements to the 767, the team was ready to begin testing for the 1989 season. 1989 saw the addition of a B to the end of the 767s name. The car also underwent an exhaust system make-over moving the pipes to the side of the car, and an overall reworking of the powerplant and drivetrain to increase the cars reliability over long distance racer. These tweaks laid the groundwork for Mazda’s 1990 prototype attempt. But staying in 1989, the revised car was significantly more competitive and successful, taking GTP class victories in the World Sportscar Championship at Dijon, Nurburgring, Spa, and Mexico. Despite this solid performance, it seemed an overall win at any event was impossibly far away, and it seemed time was running out for the Japanese manufacturer. While Mazda’s 767 car was battling in the GTP class, fellow countrymen Toyota and Nissan were looking competitive in the C1 class, giving the top dogs in Sauber Mercedes and Jaguar a legitimate run for their money. Nissan Motorsports R89C was a powerhouse, though somewhat unreliable, and the Toyota 89CV was a consistent performer. Both seemed to have the potential single race performance to challenge at Le Mans, and a betting man would have put their money on either of the two manufacturers to take the victory before Mazda. Additionally, with wind of the approaching FIA class tech regulations overhaul to move to the 3.5L formula, Mazda’s bread and butter rotary power would be rendered obsolete. Years of Mazdaspeed effort to achieve their ultimate goal therefore lay squarely on the back of the next rendition of their prototype racecar.